Hello. It has been a while since I last wrote on this blog but here I am again with a new adventure. Last that you heard, we had returned from our Christmas season in Adelaide. It wasn’t too long after our return that we were packing up again. A year earlier we had booked to go on a cruise around New Zealand, leaving the end of January 2015. We felt that a cruise would be a great way to get a general overview of a country that we have wanted to visit for a long time. And it was! We saw highlights of the south island and the north island, plus we traveled through some awesome fjords (called Sounds) – more about that later. It took hundreds of pictures, but I will spare you that “treat”. I hope that you enjoy this short insight into our New Zealand experience, and maybe it will inspire you to visit there one day. Be patient, though, the first part of this post is of the cruise ship. Maybe you will be inspired by that too. 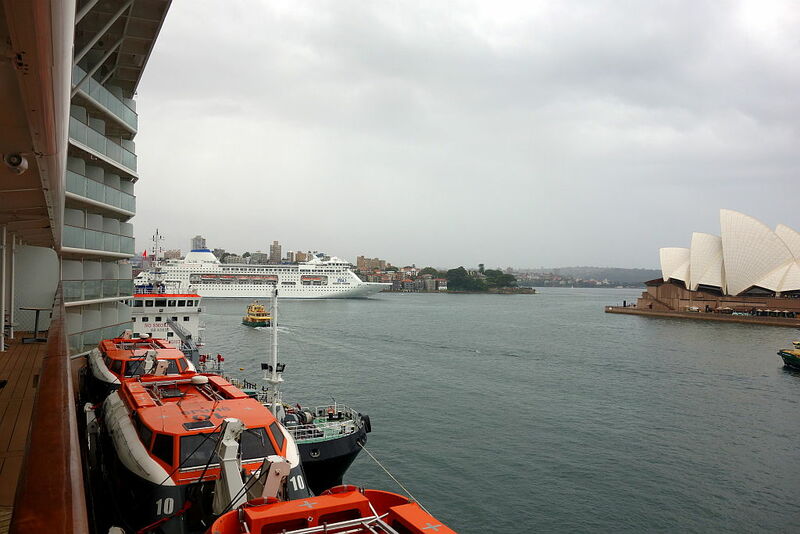 The iconic Sydney Opera House, as viewed from our room veranda on the Celebrity Solstice, on this rainy day. 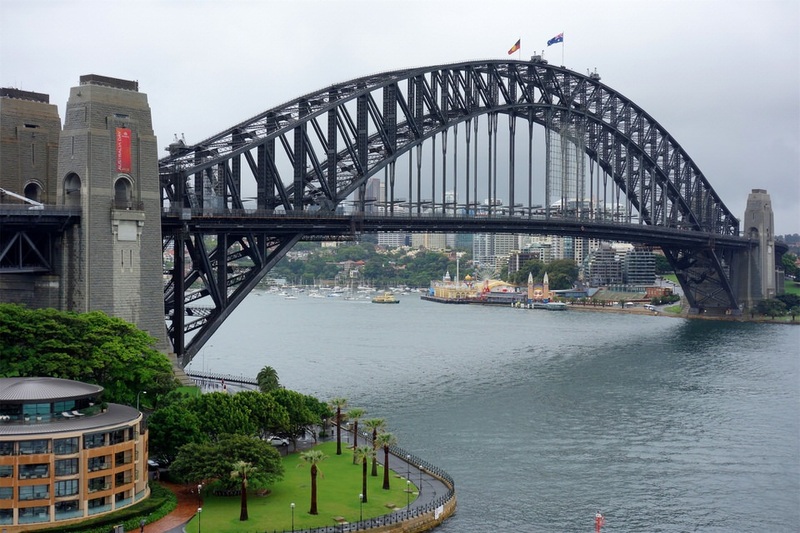 We are not quite as tall as the Sydney Harbour Bridge, but we still have a great close up view of it from a good height. We start in Sydney, Australia. After leaving Brisbane on a sunny warm morning, we arrive in Sydney to pouring – and I mean, pouring – rain. Providentially, we managed to score a free shuttle to the port terminal and after the usual fuss and bother of checking in etc… we go in search of some food and drink and then we set out to explore the ship. The pictures that follow show some pictures of the cruise ship and the Sydney port. Cruise ships often dock in Circular Quay, which is a main transportation hub for ferries and all kinds of boats. As well, the main business district sits at the inside end of the quay (pronounced “key”). On one side is the Sydney Opera House and on the other side you can see the Sydney Harbour Bridge. 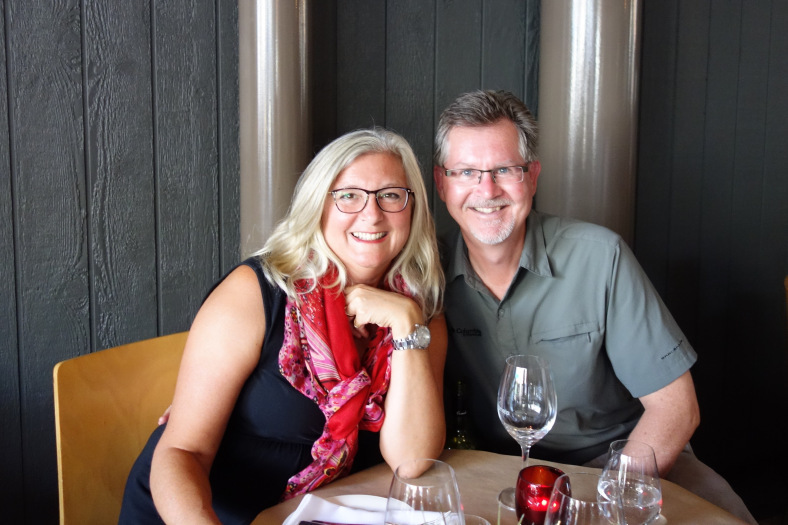 It is a fabulous port location, and although we have been there several times now, this is our first experience viewing it from the height of a cruise ship. Our veranda has a great view of the Sydney Opera House – for now. Ed checks out one of the 14 story glass elevators. 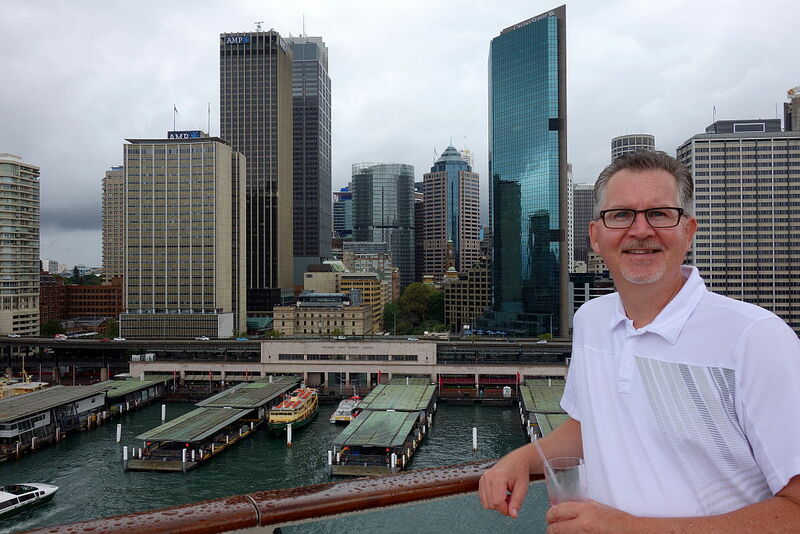 Backdrop of Sydney CBD from ship’s top deck. From our own veranda we watch another cruise ship leave the port and head out to sea past the Sydney Opera House. 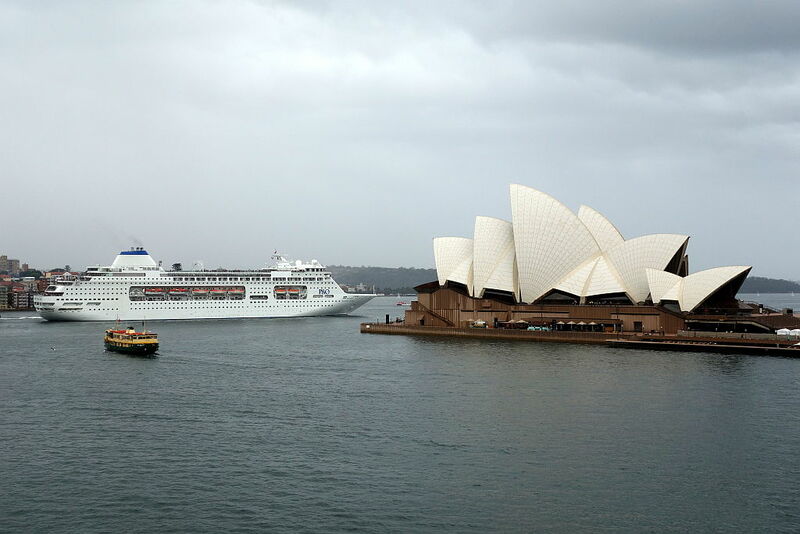 Cruise ship sails out of the harbour past the Opera House. The Celebrity Solstice is a luxurious 122,000 tonne ship that holds 2850 passengers and boasts a crew member for every 2 passengers. We found the service excellent – everyone was considerate and polite. We got a drinks package with our room price and enjoyed unlimited drinks (to a certain price point per drink). There are several places to swim, both indoors and out. Today, we have had enough of being wet, so we find a cabana chair and take advantage of the peace and quiet. Let’s check this out while no one is around. Ed enjoys a rest at one of the beautiful seating areas throughout the ship. A lovely aspect of cruising is that you unpack once and yet you get to travel to all sorts of places. We enjoyed our room and because this cruise had the theme of Top Chef, we watched all of last season’s Top Chef series, during the course of our cruise. This is a show that we don’t get in Australia, so it was perfect for us as we have missed the last couple of seasons. A room with a view (and a veranda). Tasmania is not the warmest part of Australia, by any stretch of the imagination, but it is loaded with lots of character and the warmth of the people who live there, makes up for the cold. Quality produce is something that Tasmania is known for, whether it is from the sea or land, you can count on the quality if the label says, “made in Tasmania” – something that Ed and I had already discovered in our time in Australia. We also enjoy watching a TV series called “Gourmet Farmer” about a former Sydney food critic who trades his city suits for warm wellies and woolies, to learn how to live off of the land. We get some hope that if he can learn how to do it, so can we. Hobart, like many places in Australia, was founded as a penal colony, in 1803. 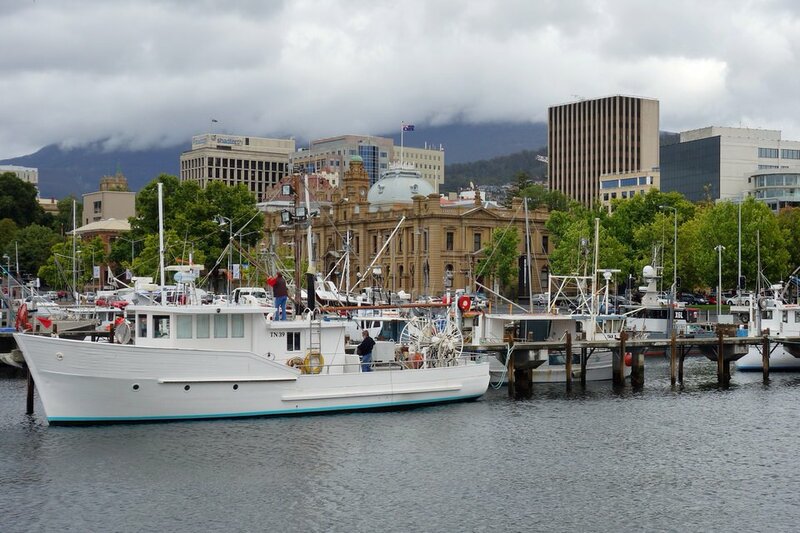 Hobart has grown into a hard working city, having experienced successful industries in whaling, ship building, mining, agriculture, and shipping. Hobart’s deep water port establishes it as a prime site for shipping, and is the last port of call for Australian Antarctic Division and French expeditions to Antarctica, and a popular port for naval vessels from all over the world, including the US Navy. 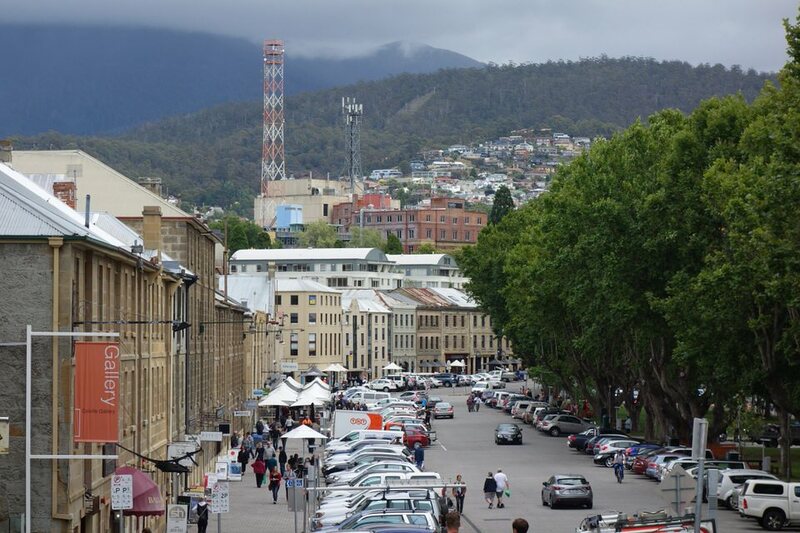 Hobart is a lovely town to explore and beautiful, right on the ocean with Mt. Wellington rising behind it. Unfortunately the cloud cover prohibited us from seeing the mountain, but we know that it was there. First thing on land, we head out to find one of the most famous of Hobart’s many coffee shops – Daci & Daci. I was desperate for a good cup of coffee. The cruise ship did not serve good coffee! As a bonus, at Daci & Daci, there were many delicious French pastries to enjoy. After, we spent a lot of time exploring Salamanca Marketplace, with it’s lovely artsy shops, galleries, food establishments – and even nicer people. There are a few establishments vying for this title, but this is certainly one of the oldest. Salamanca Place (left side) is a maze of galleries, craft and clothing shops, cafes and restaurants. As we wander around one of the older neighborhoods at Battery Point, with their lovely, mostly Georgian architecture, we note that most gardens are filled with beautiful flowers, most notably, roses. I love roses! Note the elaborate metalwork railings and decorative features. As we leave Hobart, I notice these interesting sculptures in the harbor. 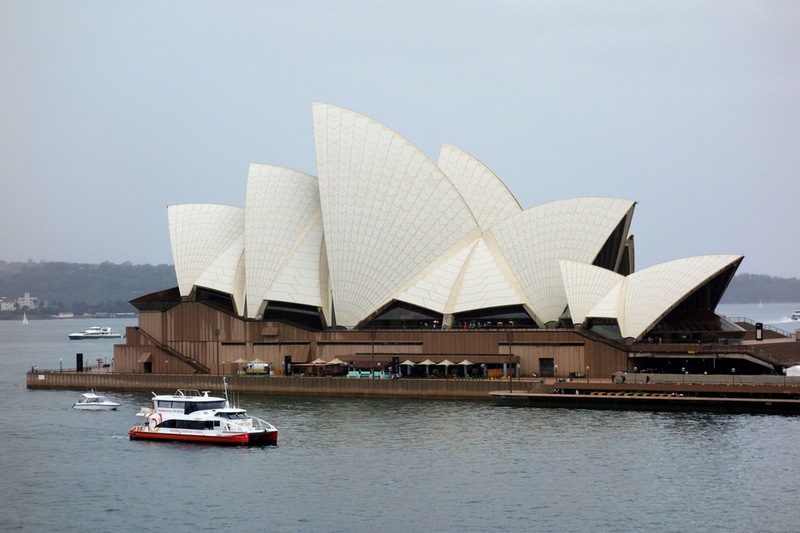 This entry was posted in New Zealand Cruise 2015 and tagged Celebrity Solstice, Hobart Tasmania, New Zealand Cruise, Sydney, Sydney Harbor Bridge, Sydney Opera House. Bookmark the permalink.